The first phase of the dumping of mud off the coast of Cardiff as part of work to build a new nuclear power station in Somerset has been completed. EDF, the firm building Hinkley Point C, said contractors have completed the work. Campaigners had demanded more tests on the sediment, taken from a site in the seabed near the new facility. But EDF said the sediment was not radioactive under UK law and posed no threat to human health. A second phase of dredging is yet to take place with work potentially taking place in 2020. 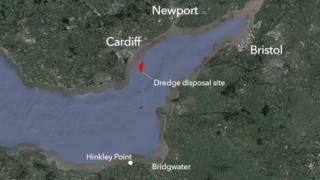 Campaigners had been concerned the sediment, which was dumped at a site just over a mile out to sea from Cardiff, could have become contaminated by discharges from the old Hinkley Point A and B sites. An EDF spokesman said: "Hinkley Point C contractors have now completed the licensed work to dredge and deposit mud in the Severn Estuary. "This mud is no different to mud found anywhere else up and down the coast. It has been thoroughly tested by a UK government agency whose experts confirmed it poses no threat to human health or the environment. The sediment is not classed as radioactive under UK law." He said further dredging "will be required ahead of drilling the vertical shafts for the cooling water system for the new power station". "We will work closely with the appropriate experts to prepare our licence application and will again comply with all requirements. We also fully support all efforts to inform and explain the dredging work to the public." EDF said 110,000 tonnes of mud was dredged and deposited. Demands for the licence to be suspended were rejected in the assembly on Wednesday following a lively Senedd debate.